Because of health concerns, doctors once suggested that Dellarontay Readus' mother not carry her pregnancy to term. She wouldn't hear of it. Instead she had the boy and raised him on her own. On Tuesday Readus, who was accepted at all eight Ivy League institutions, announced that he is heading to Stanford University. 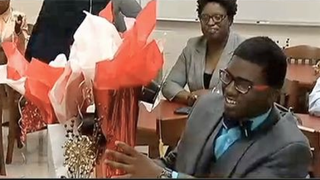 "I would never have imagined in a thousand years that I would have something like this," the Memphis, Tenn., teen said at a news conference, WREG reports. Readus told those gathered that it hasn't always been easy, but that didn't make it insurmountable. "I went to church one day, and I was, in fact, getting some food for home, because we didn’t have anything to eat," he recalled. "You have to be willing to go a step further to do the things that you want to do. I didn’t have the resources necessary to get it done by myself, so I had to go out and find them." Readus, who maintained a GPA of over 4.0, told those gathered that he plans to start his own startup while attending school. "I plan to have a successful business by the time I get out of college, and then after college … Bill Gates, baby. Bill Gates," he said, grinning. As a reward for his hard work, Samsung gave him "a computer, tablet, phone and free service," according to WREG. "I would never have imagined in a thousand years that I would have something like this," Readus said.